Westport is expanding its 2015 vehicle lineup with natural gas fueling options for companies who are adding the all-new Ford Transit Van and Cutaway to their fleet. 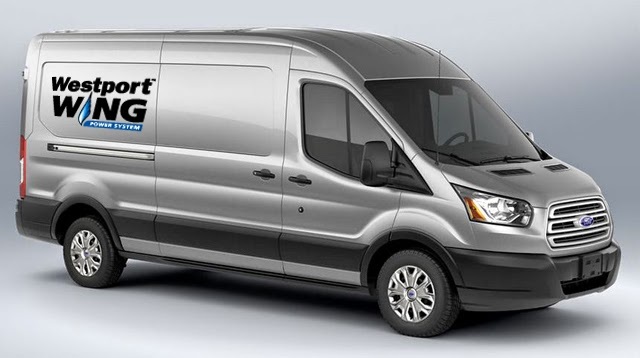 As Ford’s largest qualified vehicle modifier, Westport is offering the 2015 Ford Transit Van and Cutaway as a dedicated natural gas (CNG) Westport WiNG™ Power System vehicle. The Transit Cutaway will be offered at 10,000 GVW and below. Both versions of the Transit Van and Cutaway will be EPA and CARB certified. Westport's Transit Van and Cutaway will be compliant with Clean Port Act emissions standards, ensuring that fleets and small businesses who service airports can take advantage of natural gas. Used to transport passengers and cargo, the 2015 Ford Transit Van and Cutaway models offers a 3.7L gaseous prep engine. Visit http://www.westport.com/wing for more information about our bi-fuel and dedicated CNG Ford vehicles.